I’m Thinking of Blogging Again, Anyone Out There Anymore? I’m thinking of blogging again. I stopped blogging a few years ago for two reasons. One, Chicago Moms Blog went away and I lost my larger forum for my posts and two, some of my relatives found out I was blogging and the pseudonym I was using so I didn’t feel like I could be as open and honest. Today, I feel like my relatives have moved on and would not know whether or not I’m back to blogging again unless I tell them. Why do I want to start blogging again? Well, I think I need the outlet again. I’m having marital problems and I can’t talk to my husband about them because he is not listening or trying to fix what is wrong. So much is going on in the world and I’d like to “discuss” it with others (and vent) and, again, when I try to talk to my husband about current events, he stares at me blankly. Sometimes he flat out says, “What does this have to do with me?” or “I really don’t care about that issue . . . ” Nevermind the fact that I care about it and he could at least feign interest for my sake. I have friends and we do discuss current issues, but I don’t see or talk to them everyday. When I have a burning issue, I just want to get it out of my system. I’m thinking this is a typical problem the SAHM faces. It is rare to have an adult conversation. Good question! My anonymity has been compromised so I’ve had to remove the majority of my posts. Whether this blog will continue at all, or whether I will have to trash three years of blogging and begin again under another pen name, I haven’t decided yet. This is all too fresh and I am very very very distressed about this. Any suggestions? This week, CongressDaily published some of my conversation with Secretary of Agriculture Vilsak. I hope someone in power will read it and understand that we can’t just talk about the health of our children and invent new programs to “help” them. It is a question of where we are putting our money. All the jumping jacks and walks to school must be supported by healthy food!!! The love of a fresh spinach salad with a whole grain roll will last long after they leave school. Yes, walk to school, but many children are greeted by donuts and Fruit Loops. Increased quality of meals served in the school meal program; including less use of highly processed foods which are high in fat and sodium, increased fresh and high quality fruits and vegetables, more whole grains, and reduced overall sodium content. Strengthened nutrition standards for school meal programs and competitive foods. New startling photographs prove what has been known for a long time, that Ringling Brothers tortures elephants. It is not ok to torture animals for our amusement! My children have never been to the circus, and will never go as long as animals are abused in this way. Don’t shut a blind eye to this. 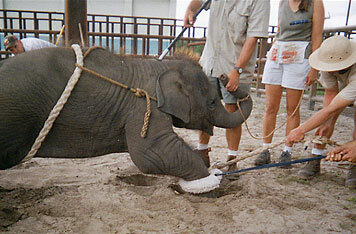 Please look at these pictures taken by a former animal trainer for Ringling Brothers. Really? 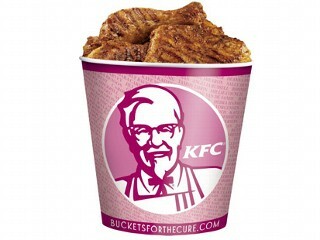 Eat fried chicken and cure cancer? This is Susan B. Komen Campaign’s latest idea. I’ve had it with the “buy this and cure cancer” crap. Maybe I would feel differently if I had cancer, but I’d much rather give the 50 cents to fight cancer than buy this. I think I really lost my faith in this pink campaign when I saw a pink vacuum cleaner for sale. “Clean for the Cure,” oy! Isn’t this all just not-for-profit run amok? Click here to go to my recent post on Chicago Moms Blog about my three-year long battle with our school lunch program and what we can do about it now (write your representatives!). Also, see this recent article here (not written by me) and one in the New York Times (also not by me). Did you know that if you are good to our earth that you will also be good to yourself? I don’t mean in an indirect way, that we’ll all have have a better place to live, etc. I mean, if you, for example, use cleaning products that don’t pollute the earth’s water, then it just so happens that you won’t be polluting the air you breathe in your own home and the table you are eating your food off of will be safer too. I’ve been “going green” ever since we adopted a dog in 1999 with severe respiratory problems. I had to discontinue using those popular brand cleaning products which contained bleach or ammonia in exchange for non-toxic, non-polluting cleaning products like vinegar and baking soda. Because I am sensitive to chemicals and would suffer a sore throat whenever I cleaned with those toxic products, I was thrilled with the change! When we moved into our suburban home a year later, we continued to protect our dog from harmful toxins by refusing to use artificial fertilizers and weed killers on our lawn. Ten years later, our lawn may have few more dandelions than the lawn next door, but it is still beautiful, and it doesn’t poison me, my dog, or my children. 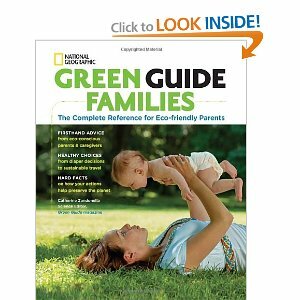 Thanks to Chicago Moms Blog, I was given a copy of National Geographic’s Green Guide Families by Science Editor Catherine Zandonella. This book’s secondary title, “The Complete Reference for Eco-friendly Parents” is, in my opinion, a misnomer. It should be, “The Complete Reference for Healthy Families and a Healthy Planet,” because the information in this book should be of interest to all parents, not just the “eco-friendly” ones. This book makes it easy to protect your family and the earth from toxic pollutants because all the research and data is consolidated into this one easy guide. Oh, how I wish I had this ten years ago. Oh, how I wish I had this book when I was pregnant. It would have saved me the countless hours I spent pouring over medical journals, magazine articles and books trying to make sure everything in our home, from the clothes we wear, to the paint we put on our walls, to the food we put in our mouths was as healthy as possible. There is an amazing amount of information packed into this 400 page book and every parent should know what is in here, from the hormone-disrupting toxins found in popular sunscreens( p.212) and endocrine disruptors in many baby care products (p. 208) to weighing the health risks and environmental impact of reusing carseats (p. 214). I love that this book suggests that parents go to my favorite site for ratings on the health risks for make-up, cosmetics and sunscreen: www.cosmeticsdatabase.com. The guide explains ingredients such as sweeteners and preservatives in a way that is easy to reference and easy to understand. It has ideas and guidance for healthy birthday parties, Easter, Passover, Halloween, Thanksgiving, and Christmas. The book even explains how to pick a healthier toy and a healthier chocolate treat (for you and the planet). I’m so excited about this guide that I’m going to buy one for my brother who is expecting his first child.